The Hua Jai Wicha Khayum Khloeng Nuea Pong Chompoo amulet in pink or purple Hoeng Prai powders) 2 Sariga Birds on front face, with 2 Takrut 2 Ploi Sek Maha Pokasap Gemstones, with Jing Jok Koo Mating Geckos on rear face. Empowered with the formula of the Dtamrab Dtai Hloeng (Burmese Hilltribe Sorcery), from Ajarn Bun Rod, the only known living Looksit of aged sorceror Ajarn Phu Hnan Hyad of the Dtai Hloeng Burmese/Thai Borderland Hilltribe. 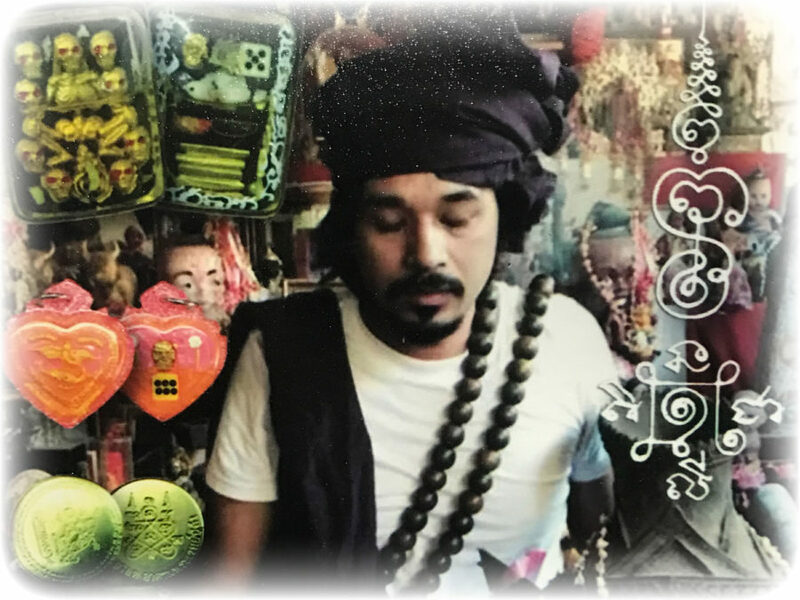 Ajarn Phu Hyad was an Uncle of Ajarn Bun Rod who moved to Thailand from Burma, and who Ajarn Bun Rod began to learn Magical Wicha from the age of 10 years old. 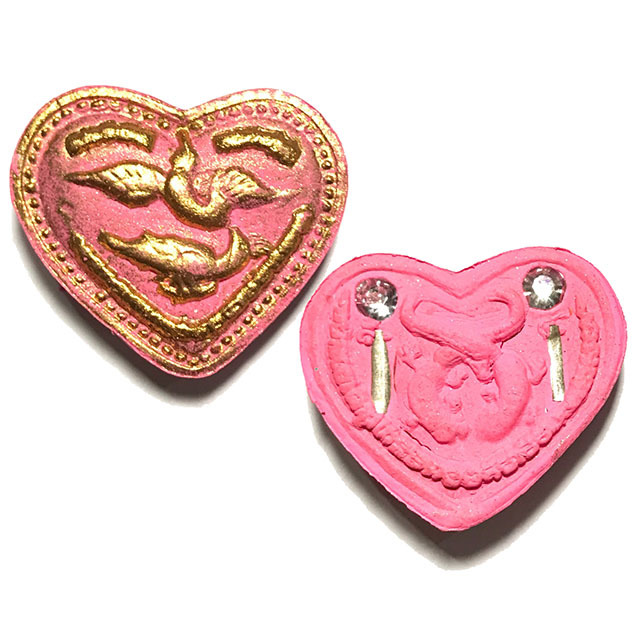 Hua Jai Khayum Khloeng Paed Saa Dtamrab Dtai Hloeng – The rear face of the amulet is embedded with 2 Takrut and 2 Ploi Sek Maha Pokasap Enchanted Gemstones, with a pair of entwined mating Geckos embossed within the heart shaped amulet. 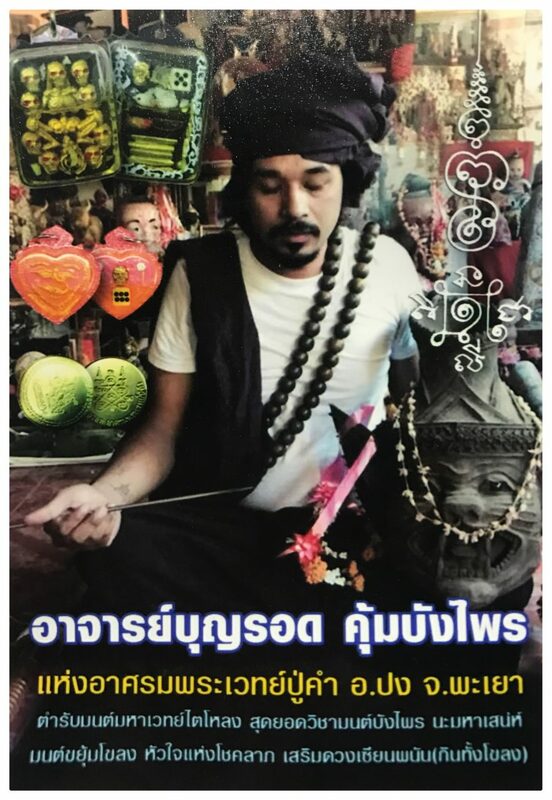 True ancient Thai Lanna Sorcery from a Master of Thai-Burmese Lanna Wicha of the Lineage of Ajarn Phu Hnan Hyad, and Ajarn Plod. This leaves Ajarn Bun Rod and a very few Burmese Hilltribe Sorcerors remaining, making it very difficult to find a master who can perform this Wicha, which is centuries old. After having learned many Wicha, Ajarn Phu Hnan said that he had no more to teach, and that his Training was complete. Ajarn Bun Rod then learned many more Wicha from Ajarn Plod, including the Wicha Saa Haek, with its triple blessings, which is imbued within this amulet along with the Wicha Bang Prai and Wicha Dtai Hloeng. The Hua Jai Khayum Khloeng is empowered to Improve the Power of Attraction and Seduction, Improve Professional Success, Increase Wealth and Promotion, Increase the Fortunes of Professional gamblers and increase sales, and improve professional advancement.